Stop into the Visitors Center at 719 Commercial Street for free Visitors Guides, maps, and brochures! 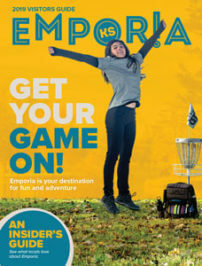 To inspire people to visit, stay, dine, shop and play in Emporia. The Emporia CVB strives to fulfill the expectations of the traveling public by providing quality, memorable experiences. The Emporia Convention & Visitors Bureau is responsible for marketing Emporia to potential visitors and meeting planners. We also serve as the visitor information center for Emporia with additional information about the surrounding area and the State of Kansas. Funding for the bureau comes from the collection of a 7% transient guest tax on each hotel, motel, or bed and breakfast room rented in the City of Emporia and Lyon County each year. The CVB functions as a division of the Emporia Area Chamber or Commerce (per contract agreement with the City) and resides with them in the Trusler Business Center at 719 Commercial Street. Our office hours are Monday through Friday, 8:30 am to 5:00 pm. Please call us at (620) 342-1600 or stop by and visit.